Actually “little Dave” got caught in the crosshairs of politics that started back in 2011 when Pres Obama signed the 2011 budget bill with the rider attached by Sen Tester of Montana that took away the ‘endangered and protected status of the gray wolf in Montana and handed over “management” to the state. All the canid lives, be they wild or domestic that have been taken in this state were traded for Tester’s vote. A pact with the devil couldn’t be more insidious then that vote. It caused the “wolf wars” “little Dave” found himself a victim. Please urge your Senators and Congress people to end this insanity and give the Gray Wolf their rightful place protected under the ESA… It was the law! Do we need more ‘little Dave’s ‘ to die and more unnamed but beautiful intelligent wolves to die because we lack the courage to do the right thing? 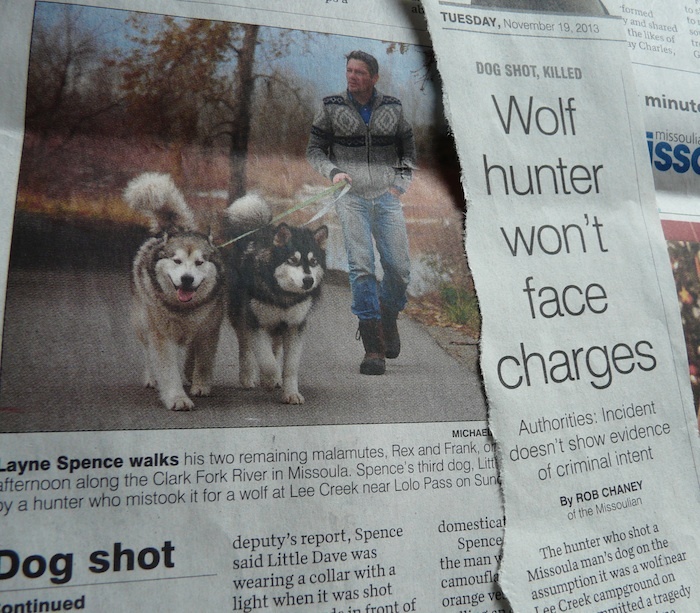 The wolf hunter won’t face any charges? He better for an atrocity like this! Get all these unthinkable/unspeakable wolf hunting laws repealed and abolished! Subsequent reports on this incident suggest that the details might be more nuanced and murky than initially reported. My initial thought is that the reporting in this story was a little lazy and one-sided, and Layne’s account might be laden with at least some measure of hyperbole. Also — not either waiting for a clean killing shot on a static animal (apparently, the dog must have still be at nearly a full run when the shooter opened fire) — or simply passing the shot up. Had the hunter done the latter — that is, refrained from shooting at a moving animal (a poor practice which almost always leads to wounding shots) — this entire tragic mess could have been avoided. @Rebecca — I’ve noted this numerous times in previous threads about wolves — but the wolf population in the Greater Yellowstone Ecosystem of Montana/Idaho/Wyoming was never intended to be placed under perpetual and permanent ESA status. 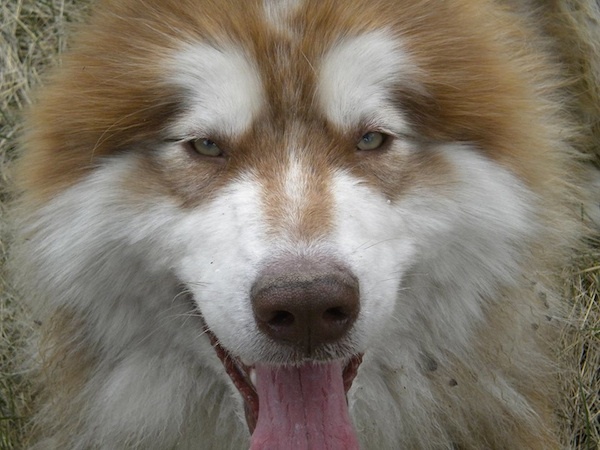 (For one thing, world-wide, Canis Lupus is hardly and endangered species). It was understood from the time the GYE wolf reintroduction program was discussed during the 1970s and 80s — and then finally implemented in the 1990s — that once that population of wolves reached certain levels — it would be de-listed and management would be handed over to the states. And, that state management would most probably involve public wolf hunting. It baffles me that people are protesting state management and wolf hunting now, as if it were some dirty secret that was sprung on them — when they had the better part of three decades’ warning that it was going to happen. All that said, as a hunter/Hunter Education instructor myself, I fully understand that there are a number of what we on the inside call “slob” hunters out there. And the vindictive nature that wolf hunting can sometimes (but certainly not always) attract lends itself to a higher chance for slovenly, unethical and unsafe “hunting” practices. I expect there very well could be more tragic situations such as this. I’m not sure what the answer is. Wolf hunting is not going to go away. The states jumped through a long series of hoops to gain management (the fact stands, the wolf populations in MT/ID/WY surpassed the supposedly predetermined de-listing threshold several years before de-listing actually happened) — so they are not about it give it up. Or, for that matter, let so many wolves be killed that ESA would kick back in. Also, according to what I can discern in reports from the field, wolves are not an easy species to hunt (and are getting more difficult as they catch on to the fact they’re being hunted) and the vast majority of wolf hunters have conducted themselves well. People can — and should — debate the details of the wolf hunts. Are quotas too low, too high? Are some areas simply not appropriate for hunting? Should trapping be allowed or banned? Again, these are all great questions to keep pressing. But the notion that wolf hunting can simply be banned because it offends the sensibilities of some is both naive and arrogant. This will continue to be a cantankerous issue on all sides. And, every time somebody does something stupid and dangerous like this — or every time some yay-hoo redneck posts a violent and graphic “wolf hunting” video on YouTube — there’s sure to be an outbreak of hysteria. Wolves are caught up on a polarized political/ideological football game, so to speak. But, I think at the end of the day, both wolves and wolf hunting are here to stay, regardless of which people whichever side get irritated for whatever reason. How is there no charges being brought against this “hunter” that cannot even identify his target ? Little Dave does not look like a wolf. You should not be hunting if you cannot identify what you are shooting at. When you cannot identify your “target” prey and kill a dog you should be charged and hunting privileges end for good. It is irresponsible to not charge and irresponsible to allow someone that clearly does not know what they are shooting to hunt again.